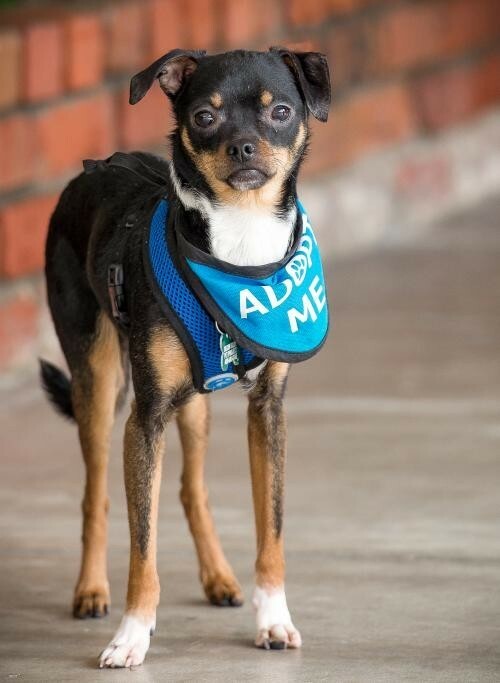 You can fill out an adoption application online on our official website.Okay, we admit it: he looks like he was put together from spare parts. He's got long and spindly legs, a hilarious underbite, a curly tail, floppy ears, and the glossiest coat we've ever seen. He's darling and sweet and so relieved to be out of the scary environment at the shelter. He's a snuggly pooch who needs some help with confidence building. His housetraining is on point and his manners in the house are pretty great (so far!). His foster family is starting to working on teaching some basic commands and we'd love to find an adopter that will continue helping him come out of his shell! Prior to adoption, all dogs are spayed/neutered, tested for heartworm, vaccinated (including rabies, if age appropriate) and microchipped. Adoption fees for dogs: http://www.svpetproject.org/info/adoption Stay up-to-date on what our dogs are up to by following us on Facebook! https://www.facebook.com/svpetprojectVisit this organization's web site to see any additional information available about this pet.